How to Download OSpeedy Driver Updater? If it still not works, you can download it on another computer and store with a USB and bring to your computer to install. and save it to a directory that you have written privilege such as c:\, then run the setup after downloaded. Right click OSpeedy Driver Updater, click ' run as administrator' if you are running windows 7/vista. On the sign window, press alt+ctrl+del button twice. I bought double order by mistake, what should I do? Don't panic, please send email to driverupdater@ospeedy.com, our support team will help you refund one order ASAP. How can I update computer drivers with OSpeedy Driver Updater? 1. Download and install OSpeedy Driver Updater. 3. Download the recommended drivers and install all. Your software is conflicted with my antivirus software. Will your software bring virus to my PC? OSpeedy Driver Updater is clean and will not bring virus to your computer. What antivirus software do you use? Do you mean that your antivirus software reports our software as a virus? In order to update the latest drivers for your computer, OSpeedy Driver Updater has to scan your computer to detect outdated drivers. Some antivirus will see such behavior as a virus behavior. But without scanning, we cannot find the right drivers, right? Please ignore the warning, and add DriverTuner in the white list of the antivirus. Can I use your software for Free? Really sorry that the free version just had scan function & some other limited functions. If you want to download a right driver for your PC, you should buy a license. OSpeedy Driver Updater or our technical support will do our utmost to help you solve driver problems. We have 30 days money back guarantee, So Register with confidence! I cannot register your software successfully, because I cannot enter all the number into the box. This problem may be caused by dpi setting of your windows system. 4, logoff windows7, and logon, and then start OSpeedy Driver Updater. How to update computer drivers without a installer CD? We have to update our computer driver to fix hardware issues but sometimes we do't want to buy a installer CD. Then how can we do a driver download or update by ourselves? Now you can read this articles to download PC drivers with the following two ways. 1 Open the Control Panel. Open the Device Manager. You may have to open the "Hardware and sound" category to find the link to it. 2 Look for hardware with a yellow ? icon. These are components that are not properly installed. You can also use this method to look for updates for components that are functioning properly. The process is the same. 3 Right-click on a "?" component. 4 Select "Update Driver Software". 5 Click "Search automatically for updated driver software". Make sure that your computer is connected to the network. Windows will attempt to find, download, and install the driver. If Windows is not able to find a driver automatically, read on. 6 Visit the component manufacturer's support page. If the automatic process doesn't work, you will have to download the driver manually. 7 Search for your component by model. You should be able to see the model in the Device Manager. If not, you'll need to consult your computer's documentation, or even open it up and look at the component. 8 Download the correct version. There may be an option to choose between a 32-bit driver and a 64-bit driver. See this guide for details on figuring out which version of Windows you have. 9 Run the installer (if applicable). Many drivers come packaged in installers, which makes installing them fairly straightforward. Run the installer and follow any prompts to install the driver. If the driver did not come with an installer, read on. 10 Return to the Device Manager. 12 Right-click on the component you want to update. 13 Select "Update Driver Software". 14 Click "Browse my computer for driver software". 15 Select the location of the INF file that you downloaded. You may need to extract it from a ZIP file first. 16 Wait for the driver to install. You may be prompted to restart your computer. Still not work? If you can not find a suitable driver for your PC with this device manager. You also can make use of a driver download program for instance OSpeedy Driver Updater. This is a powerful driver update software which hold a huge database which can guarantee you can find the exact driver for your computer. It helped many people to fix their driver issues. Step 1 Download and install OSpeedy Driver Updater. How to Update Audio Driver With Software? With the development of the technology, computer has soaped people's life and we use it to listen to music, to see films, to play games, to read Ebook. However, you are crazy or annoyed when there is no sound in the computer. All the above entertainment will be ceased. Do not worry, let me help you fix this kind of issues. Open the Playing Audio Troubleshooter by clicking the Start button, and then clicking Control Panel. In the search box, type troubleshooter, and then click Troubleshooting. Under Hardware and Sound, click Troubleshoot audio playback. If you're prompted for an administrator password or confirmation, type the password or provide confirmation. Open Device Manager by clicking the Start button, clicking Control Panel, clicking System and Security, and then, under System, clicking Device Manager. If you're prompted for an administrator password or confirmation, type the password or provide confirmation. Double-click Sound, video and game controllers to expand that category. If a sound card is listed, you have one installed. If no sound card is listed, check the information that came with your computer to see if there's supposed to be a sound card installed. If there should be a sound card installed, you'll need to install one. See Install or remove a sound card. Download OSpeedy Driver Updater for free and install it. Connect your internet and activate OSpeedy Driver Updater. The software could install Audio Driver no matter what brand or what type automatically and perfectly. Introduction of OSpeedy Driver Updater. Compatible with all versions of Windows operating systems. How to Update Printer Drivers With Software? Press the power button to make sure that the printer is on. Turn off the printer and make sure that the power cord is securely plugged in. Make sure that your outlet works and is not controlled by a wall switch or timer. The printer's voltage may not match the outlet rating. Turn off the printer and unplug it immediately. Then, check the printer labels. If the voltage does not match, DO NOT PLUG YOUR PRINTER BACK IN. Contact your dealer. Make sure that there is no packing material in the printer. Turn off the printer and the computer and disconnect the printer's interface cable. Then, print an operation check page. See Running a printer operation check. If the check page prints correctly, make sure that the printer software and your application are installed correctly. If you are trying to print a large image, your computer may not have enough memory to print. Try printing a smaller image. Besides these three situations, the out of date driver is also the reason that printer can not work. You can use this kind of way to update printer driver. The software could install printer driver no matter what brand or what type automatically and perfectly. Know More About OSpeedy Driver Updater. 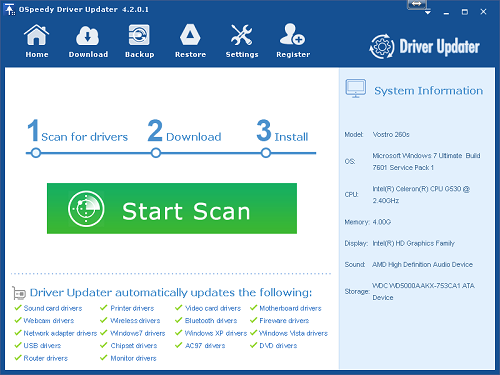 It has so many advantages including OSpeedy Driver Updater, Free Scan Missing or corrupted drivers, ?Keep Your Device Driver Up-to-date, Back Up and Restore Original Computer Drivers, Comprehensive Driver Database, Compatible with all versions of Windows operating systems. On the other side, it can update Audio & Sound Driver, Display Drivers, Motherboard Drivers, Bluetooth Driver, Digital Camera Driver, Video Card Driver, Keyboard & Mouse Driver, Network & Wireless Driver, Printer & Scanner Driver etc. In a word, OSpeedy Driver Updater is the best choice that update and install printer drivers. Thanks for reading. Hope it helps. How to Update Wireless Driver Perfectly? When you suddenly can't connect to the Internet, do you know how to check the issue like this? Unplugged or loose network cables are easy to miss yet one of the most common reasons you might suddenly find yourself unable to connect to the Internet. That's not a problem on wireless networks, but on most laptops the Wi-Fi radio can be inadvertently shut off instead. On home networks, it's also possible someone unplugged the router. Please ensure your wired or wireless network hardware is switched on and plugged in. What may seem to be a network problem connecting to the Internet is sometimes simply a Web site (or whatever server is on the other end of the connection) being temporarily offline. Please Before assuming your Internet connection is faulty, try visiting several popular Web sites rather than just one. If your computer and another on the network both have the same IP address, the conflict between them will prevent either from working properly online. Please to resolve an IP conflict, follow these instructions to release and renew your IP address. If your network uses static IP addresses, manually change your IP to a different number. The software could install wireless driver no matter what brand or what type automatically and perfectly. OSpeedy Driver Updater is dedicated to offering the best user-experience for you. With several clicks, you can download and install the most suitable driver for your computer or device. It can download and install drivers extremely fast, get the right driver in several minutes. In general, it takes users long time to scan and identify drivers. The special thing it can provide is that 24/7 customer service with professional technical team means you get help from our staff anytime you need it. At the end of the article, I give you the last way: If all else fails, contact your Internet provider to verify whether they are experiencing an outage. Some providers also give advice on troubleshooting problems connecting to their network (sometimes for a fee). Thanks for your reading. Hope it helps. My license key doesn't work, what can I do? It depends. If you buy it for one computer, you cannot use it both on your desktop and laptop at the same time. If you buy it for multi-computers, you can use the same license on both of them. We will issue a refund to our clients if they are dissatisfied with a product purchased from Speedy Software. The refund must be requested within 60 days of purchase. The refund policy only applies to the original purchaser. You can contact us via our support email: support@ospeedy.com. When you contact us, we will provide you with technical support and additional product instructions to assist you with the product. If you're still not satisfied, we will be happy to issue a refund to you. Generally, Speedy Software will issue a refund for the following reasons: dissatisfaction with the product, or if it can be verified the purchase was made using fraudulent or unauthorized payment. Please contact our support team via support@ospeedy.com.